ModuTile’s indoor or outdoor pickleball court floors are high-performance court systems built for residential backyards and/or general outdoor use. This Pickleball Court Kit is assembled with our Perforated (Drain) tile, meaning it can withstand any weather condition such as snow, heat, rain, and ice (walk with caution). The size of the full court kit is 26.5 x 52.5 feet since each tile measures at 12 in. x 12 in. x ½” thick and each edge is 12” x 2 ½” x ½” thick plus a 1” expansion. 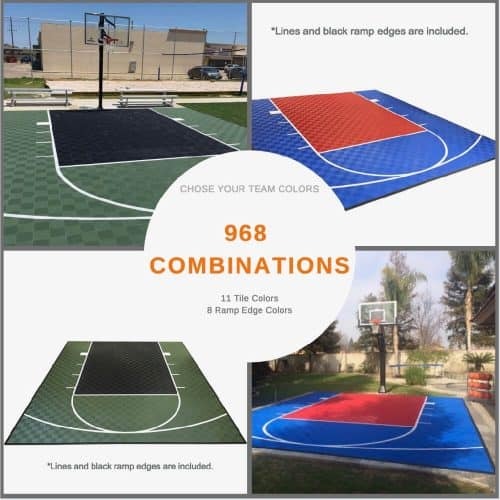 These tiles are engineered with high-impact polypropylene plastic, purposely designed to be inflexible to create a firm, flat, and uniform game court. 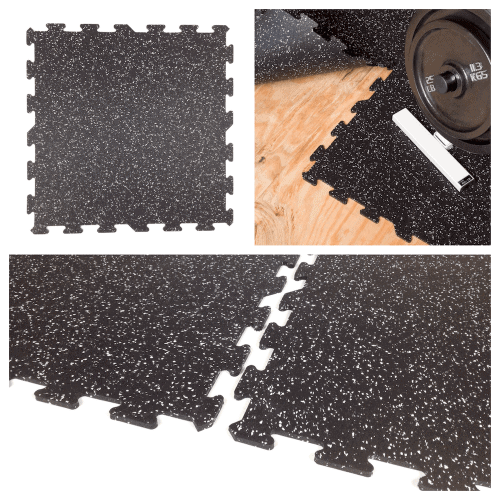 This also makes the tiles rigid and sufficiently strong enough to support heavy weights such as cars, without harming the tiles. 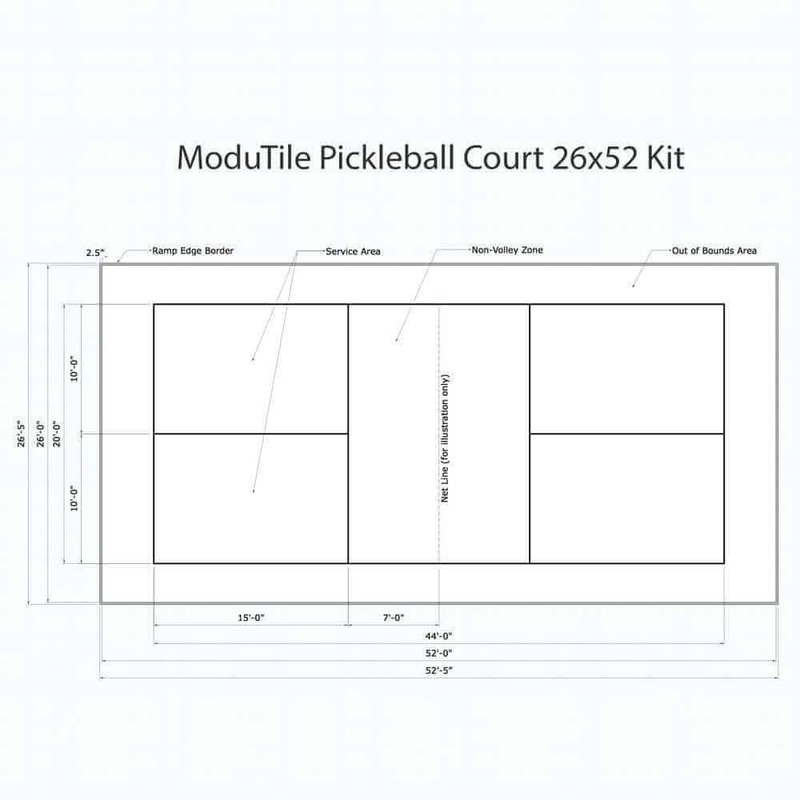 ModuTile offers a variety of color combinations; so you could have the Pickleball court made just for you! 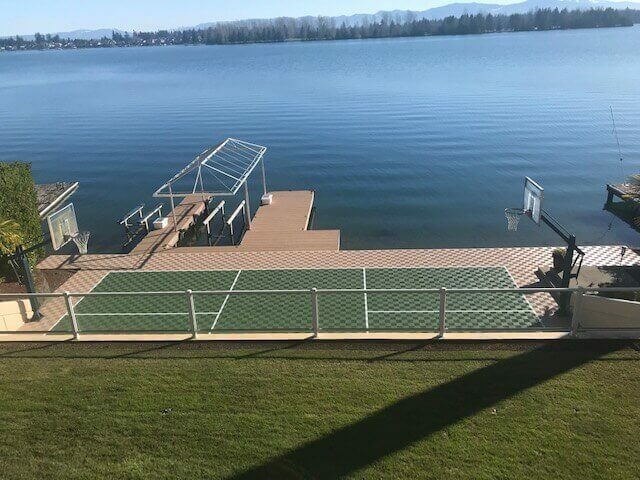 One of the many benefits about this outdoor pickleball flooring kit is that the installation can be done with your own bare hands. 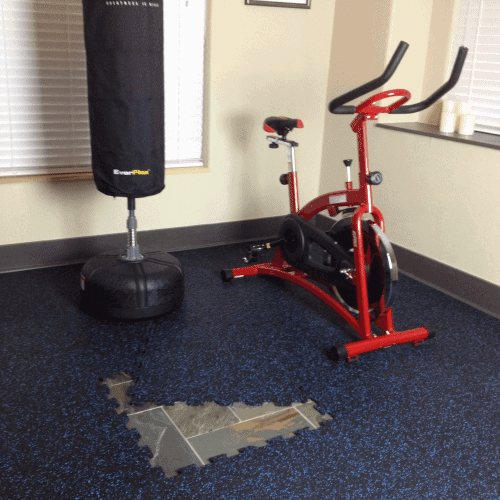 We call it a “Do It Yourself” court floor because it does not require professional installation nor professional tools. The tiles have a four loop-to-peg interlocking system, snapping together with a single downward push just like a puzzle. Disassembling the tiles is just as easy as the installation. Installation Tip: Although not required, you may wish to use a small plastic mallet and knee pads to further ease the installation process. 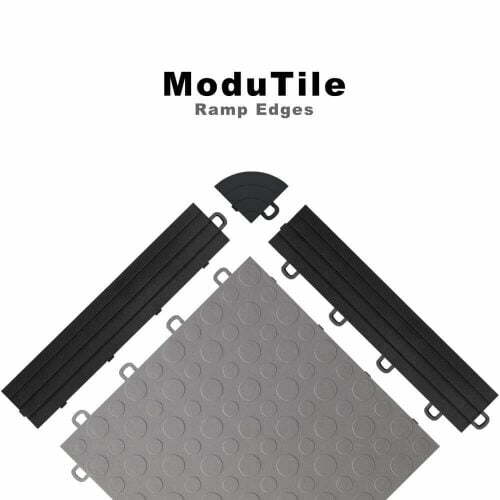 The tiles are built with a traction control feature on the surface of the tile. 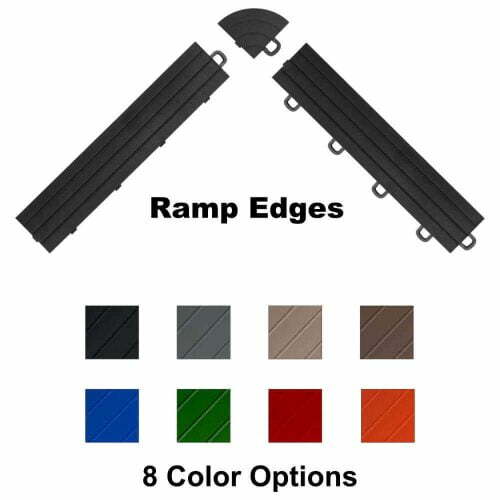 This feature increases traction to prevent slipping or sliding while playing on the court. In addition, the tiles have a grid structure base that helps prevent the floating floor from slipping. This grid structure works well with rough concrete surfaces. The grid structure and perforated surface allow water to flow under the tiles and keeping the walking surface dryer. The Interlocking Perforated floor tiles used to build this outdoor court are UV stable and made for direct sunlight exposure. This makes the tiles resistant to fading. In addition, the custom painted lines have a UV protection coat that allow the lines to last for many years before needing to be re-touched. These tiles are manufactured with small holes all over the surface and contain a grid structure underneath, to allow water and air to flow through the tile. This also allows water to drain out with a slight sloped concrete. High-impact polypropylene is a mold-resistant material which prevents microorganisms from developing. The Pickleball court lines are painted based on the USA Pickleball Association (USAPA) regulations. The lines are painted to the 2-inch standard. The names of all the lines featured on the Pickleball Court are listed below. Please see the picture to the right for a visual demonstration of the lines and areas of the court. 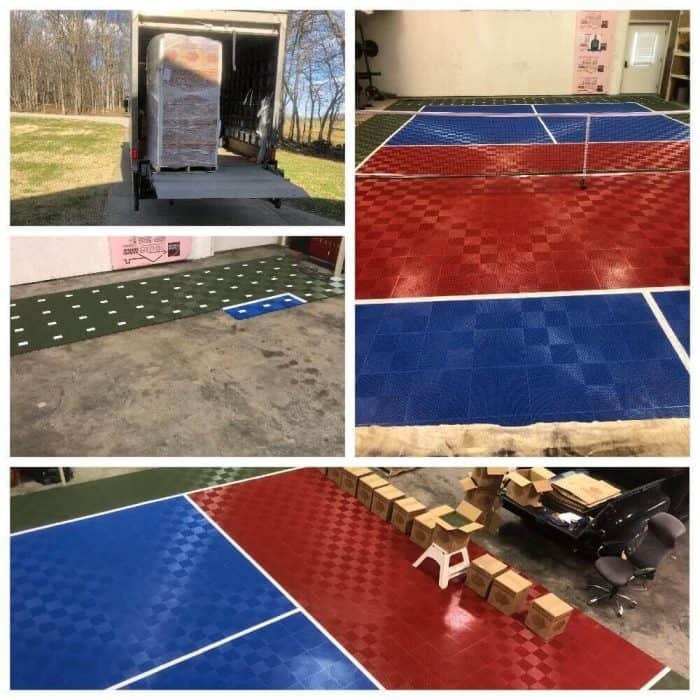 This specific Pickleball court floor kit may not be the exact size of your specific slab; therefore, you may request a custom size. These courts are made based off the USA Pickleball Association (USAPA). 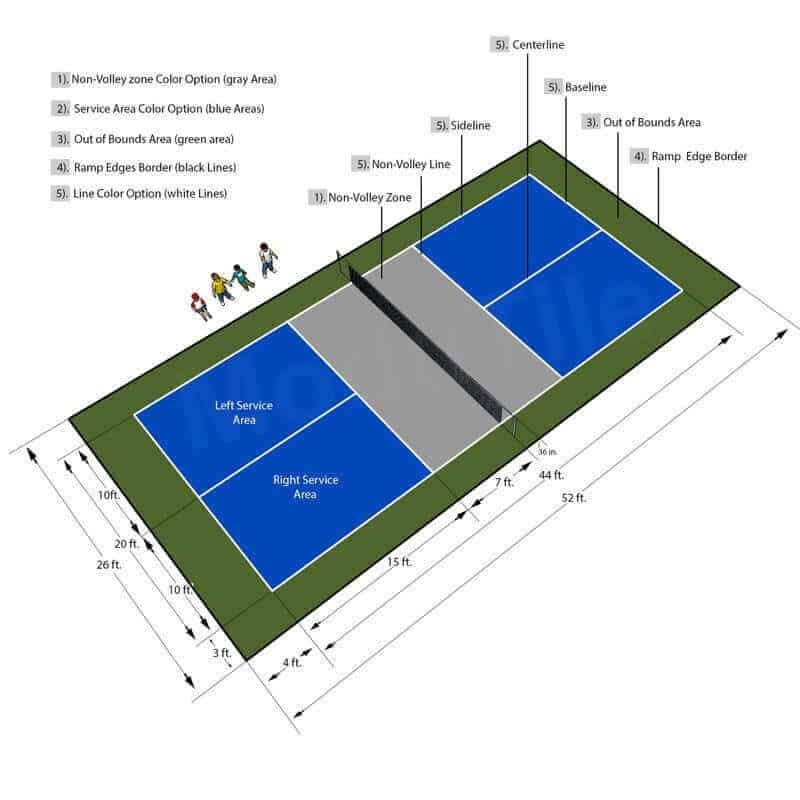 However, we do make custom courts as we know these dimensions are not suitable for all residential spaces. 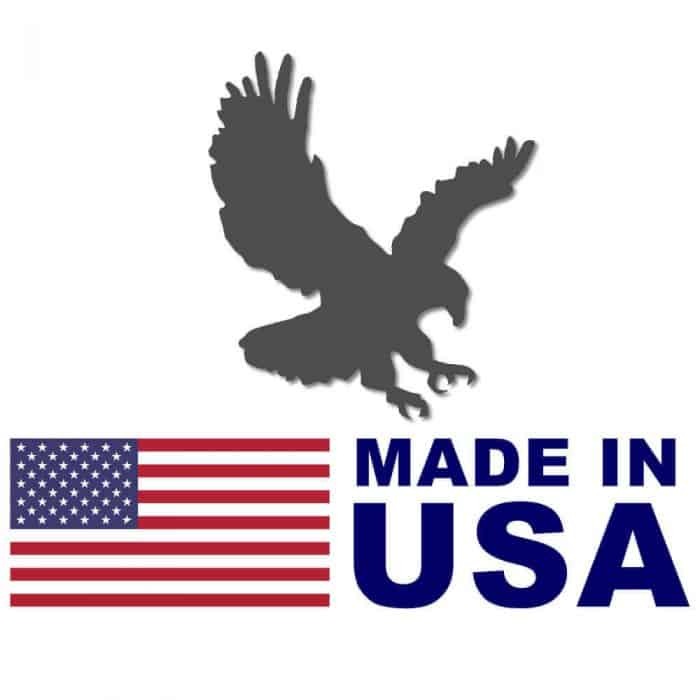 Customer options regarding this product are not limited to just one dimension. 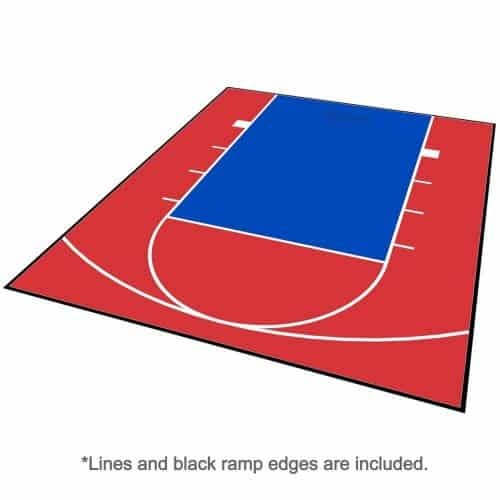 You are welcome to contact us via email or telephone with your custom court size. We can create any custom size with a 3 to 5-day turnaround time. By request, we can customize the lines to fit your concrete slab dimensions and needs. If your concrete slab is large enough, we paint the lines based on the USA Pickleball Association (USAPA). If sticky debris remains on the tile, it is advised to rinse off your court. Unlike other courts, the web-like design of the court flooring generally requires only one simple type of cleaning method using mild soap and water. You may use a shop-vac to clean small debris. Routine cleaning will extend the life of the flooring.